Design Professionals need to stay abreast of progressive wood industry issues and changing building design standards. 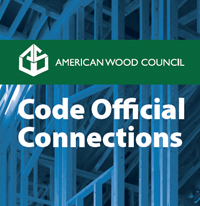 To help professionals stay informed about the technical issues affecting the wood industry, the American Wood Council (AWC) offers a Design Professional Membership. The American Wood Council (AWC) provides wood design and construction information to assist engineers and architects, develops structural and fire performance data on a wide range of traditional and engineered wood products, and engages in long-term research. Optional listing in AWC Design Professional Services Directory with description of professional services. Member discounts on Technical Publications. Wood Design Focus, the Forest Products Society quarterly journal (PDF Only) of contemporary wood engineering. Wood Design & Building, a quarterly North American magazine on design and construction of modern wood buildings. Frequent updates on wood industry developments, association activity, new publications, and special reports on engineering, building codes, standards, fire technology, and research projects. Announcements of seminars offering CEU credits. Access to AWC's group on LinkedIn®. Download our free Design Professional Membership Brochure! A current AWC Design Professional Member who refers a colleague who becomes a DPM can request one complimentary AWC publication – hardcopy or electronic. Make sure your colleague lists your name in the “Referred by” field on the application form (this offer does not apply to Code Official Connections). If you are currently receiving our emails or participating in our education offerings, you already have an account with us. Email membership@awc.org if you are interested in upgrading to a Design Professional Membership today! * $100 per year for residents of the U.S. and Canada, $150 residents outside the U.S. & Canada. Membership dues are based on the calendar year (January 1 - December 31). Dues are pro-rated depending on when your application is received. January 1 - June 30: full dues; July 1 - September 30: 25% pro-ration. New or reinstated applications with payment received on or after October 1 will be given membership for the remainder of the current year and the next calendar year. Go to Code Official Connections page. Students receive discounts on publications and a free educational version of Woodworks when they obtain a free student membership. Student memberships are granted for 6 months to students who are enrolled full-time in a wood design course at a U.S. college or university. Your student email address, university name, course name and professor name are required when applying. Your enrollment will be verified prior to having your membership approved. ** Examples of savings for some popular design tools. Other publication discounts available as well. All prices in US dollars. Shipping charges extra. Dues, contributions, or gifts to AWC are not deductible as a charitable contribution for income tax purposes. Payments, however, may be tax deductible as ordinary and necessary business expenses subject to restrictions imposed by recent federal tax law changes. No portion of your Design Professional Member dues are allocable to lobbying.